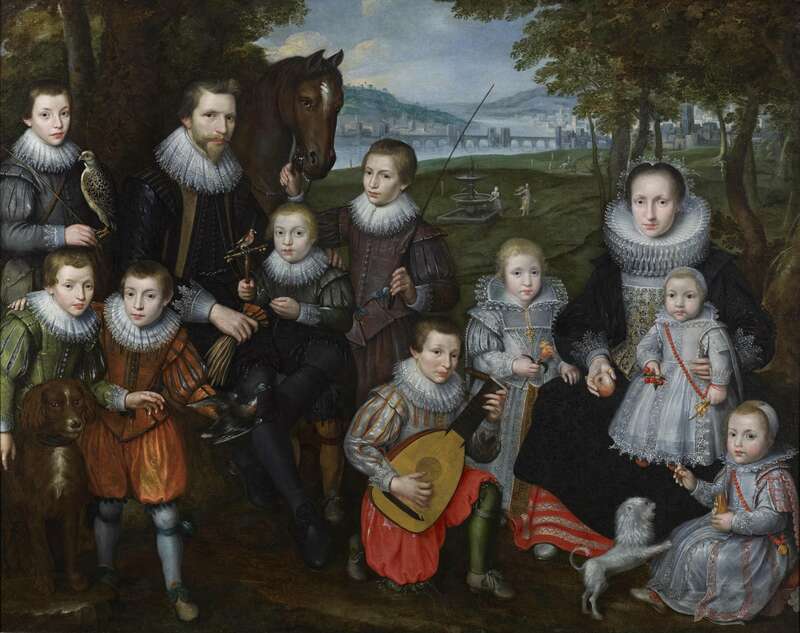 This extraordinary group portrait bears close comparison to Otto van Veen’s painting of ‘The Artist Amongst His Family’, (The Louvre, Paris), signed and dated 1584. On an equally monumental scale, in that portrait Van Veen depicts himself at his easel in his studio, surrounded by seventeen members of his family. It is notable for its distinct shift towards a more informal style of group portraiture, the composition more loosely structured than hitherto seen in Netherlandish group portraiture. Painted only a few decades later, our painting shares this informality, and introduces yet another important element with its naturalistic landscape setting. Here, the sweeping view in the background with river, bridge and distant town, and hills disappearing into a fading blue sky, clearly owe a debt to contemporary Antwerp landscape painters such as Joos de Momper (1564 – 1635). It provides a sylvan scene some years in advance of the pastoral settings commonly found in Dutch and Flemish group portraiture in the second half of the seventeenth century. The Weiss Gallery, The Courtly Image: Early Portraiture 1550 ~ 1680, London 2002, cat. no. 16, p. 33. Our portrait displays the artist’s great skill in creating a composition where the figures are set within a series of complex and triangular arrangements. The wealth and status of the patrician family is most obviously reflected in the expensive fashions that they wear, as well as by the scale of the commission. It also performs another function as a visual metaphor of the importance of family life, procreation, education and the grace of a godly upbringing. This is conveyed by the symbolic and allegorical significance of the differing objects that various sitters hold. For example, the youngest child bears a bunch of cherries, a symbol of their innocence. The goldfinch is associated with the Christ child, and the mother grasps an apple in her right hand, an allusion, perhaps to Eve, but also a symbol par excellence for child-bearing; just as nature has to be well cultivated to bring forth healthy fruit, so children need to be trained and correctly reared. This same symbolism applies to the animals and birds included. Lastly, the rather incongruous fountain behind the central figures may be perhaps considered a metaphor for the ‘fountain of life’. Although Otto Van Veen was born in Leiden, he is considered a Flemish painter as he spent most of his working life in the Catholic southern Netherlands. He was active in Rome, c. 1574 – 1580, and left Italy an accomplished painter and draughtsman in the mannerist tradition. Seeking patronage, he travelled first to the court of Rudolph II in Prague and then on to that of William V of Bavaria in Munich. By the early 1580s however he was back in the Netherlands as court painter to Ernst of Bavaria. Desiring a grander stage for his talents he went on to Brussels becoming court painter to Alessandro Farnese, 3rd Duke of Parma. He finally settled in Antwerp in 1592 where his studio became one of the most successful and productive in the city. Van Veen’s fame and reputation was such that Peter Paul Rubens chose him as his final master whilst completing his apprenticeship. His knowledge of Italian art provided the inspiration for many of his religious commissions as well as mythological and historical subjects. One of his most famous works, dating from 1589, is The Mystic Marriage of Saint Catherine (Brussels, Musées Royaux des Beaux-Arts). Grove Art Online, https://doi-org.ezproxy2.londonlibrary.co.uk/10.1093/gao/9781884446054.article.T088415, accessed 12/02/18. Hans Vlieghe, ‘Rubens and van Veen in Contest: A Marginal Note’, Studia Ioanni Bialostocki, 1981, pp.477 – 482.